ITP is a pretty basic name, but it gets the point across. Before we even get into the service, I have to talk about the page itself. If you scroll over the buttons here, the bar jumps down, and then jumps back up. It’s annoying and you can’t get a good look at the prices. You can’t even click on the box, you have to leave the cursor over the box. This is just not consistent with how you make a web page today, it’s not a very clever innovation, and can come off as annoying. Same thing happens at the bottom of the page, when you pass the mouse over the text, you get a text cursor, like Microsoft Word, but it’s actually a hyperlink. It’s a little confusing at first. But, once we’ve got that nit thoroughly picked, let’s see the features. You also have call rules, such as find me/follow me, and a day/night mode, which are more associated with business phones, and it’s great that you can bring those features home. You even have on-hold music. You have a wake-up-call, so you can program your phone to ring at a certain time, just like a hotel wake up call. Call recording, and voicemail to email. 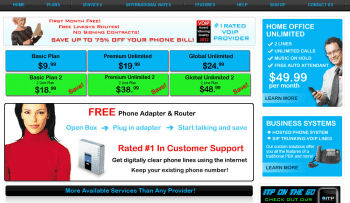 Those are already premium features that you can never get with a legacy phone service, and, compared to other VoIP providers, those features are uncommon but not unique. There’s also failover, which they call “forward on no internet,” distinctive ring, which you can use to customize your ringtone when certain VIPs call you. If you have long distance friends and family, you can choose your own number, regardless of your geographic location, and you can have a second virtual number for an extra $4.99 per month. You can set your ITP account to make and receive calls over your other devices, like your PC and your smartphone, that will cost you a premium of $9.99 for each plan, and there’s also a V-fax option, also for $9.99. You can have a virtual fax, or a paper fax, these are separate premium plans, each costs $9.99. If you have long distance friends and family, you can get a virtual number, or even an international virtual number. There’s also a virtual calling code. This is like having a calling card, so if you’re not home, you can dial into your own ITP account and make cheap international calls. You can also get a toll free number. The basic one line plan is a very cheap $9.99 per month. That includes 500 minutes, just so you know the average US residential customer uses 400 minutes a month, so this is a good deal. You can get unlimited calls for $19.99, or an international plan that gives you unlimited calls to certain international destinations for $24.95. And you have similar plans for two lines: $18.99 for 1000 minutes, $38.99 for unlimited domestic, and $48.99 for international calls. Remember, these are all outgoing calls, for incoming calls, you can get a virtual number. Every plan comes with a free router and ATA device. Also, both lines have the same phone number. Finally the tech support, both online and phone, are simple, easy to understand, and easy to reach.